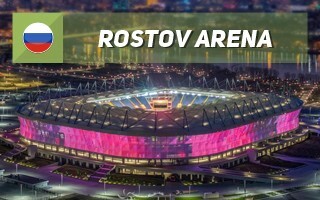 For Rostov-on-Don the 2018 World Cup became a transformational opportunity. The municipal and regional authorities decided to redevelop the left bank, previously almost unoccupied. The only downtown bridge was leading to an empty wetland and it's precisely here that the new stadium was to be built. Its plot of 36.4 ha was covered with water for part of the year, so it had to be filled with massive amount of alluvial material (1.6 m3) to raise the ground by 6 meters. The official concept was drawn by one of the global leaders, Populous. The company proposed a uniquely formed, entirely assymetric stadium for 44,000 people, which was to have a lightweight membrane roof consisting of two large overlapping segments. Unfortunately, this ambitious project with heavily landscaped perimeter and built-in multi-level parking became a dream that would never come true. Russia's economic situation was worsening at the time and it was already clear that initial cost estimates were unrealistic. Back in 2010 it was hoped that a FIFA-compliant stadium would cost RUB 6.6 billion. By 2014 it was 14.5 billion and before 2015 it was nearing 22 billion already, which meant severe cost-cutting measures had to be taken. 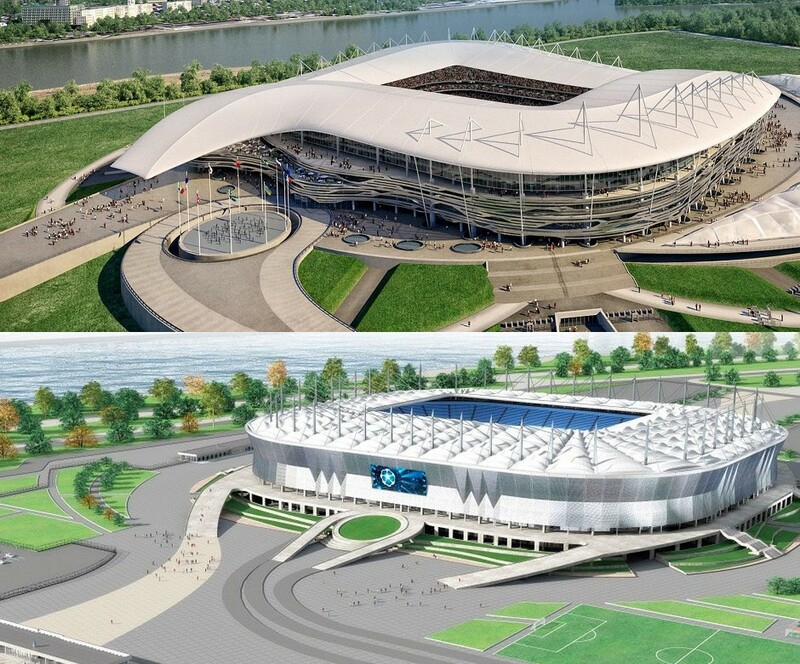 Even with a long list of compromises the stadium is among the most expensive built in Russia, priced at RUB 19.8 billion upon completion. The harsh efforts to cut costs led to almost complete abandonment of the initial concept. All unnecessary elements were dropped, the building was maximally unified and simplified, which means it now has two axes of symmetry instead of none. Limited landscaping, no multi-level parking and very disciplined outer form. Now the stadium's most iconic element is its facade. Covered with perforated aluminium, the stadium has built-in LED illumination throughout its facades, coming to life at night. A separate large screen is built into the western elevation, from where vast majority of visitors approach the stadium. Similar simplification was involved in the new roof. Now consisting of 46 identical longspan steel girders, it's covered with 49,500 m2 of PVC membrane. Its support columns are the tallest point of the stadium, at 51.5 meters. The auditorium preserved a small piece of the initial concept, which suggested openings in two corners of the upper ring of seating. However, instead of opening towards the city on Don's right bank, the corners are filled with videoboards. Before the World Cup total capacity of the stadium was announced to reach 45,000 people, though only over 40,000 net capacity. Afterwards, in heritage mode, the size is to be slightly reduced, to under 38,000. Behind the stands there are 5 levels of facilities. In total the building offers a floor space of 128,000 m2, of which almost half includes enclosed and heated surfaces. However, the most important developments are still to come around the stadium. More landscaping and leisure amenities are to grow in legacy of the World Cup, while large office and commercial investments are expected to bring the area to life further.